The six teams ranked in the latest Perfect Game HS Top 50 entering the Georgia state playoffs all swept their opponents to advance to the second round in their respective classes. No. 3 Winder-Barrow (29-2), the highest nationally ranked Georgia team in multiple polls, defeated Harrsion 3-2 in eight innings in game one. In game two Bulldogg pitcher Darrell Woodall pitched a one-hit, nine strikeout complete game as Winder-Barrow completed the sweep with an 8-0 victory. Winder-Barrow will face Richmond Hill in the second round of the 6A playoffs. Richmond Hill swept Stephenson to advance. No. 9 Parkview (28-4) racked up 20 runs on 19 hits in a sweep of Forsyth Central to advance. 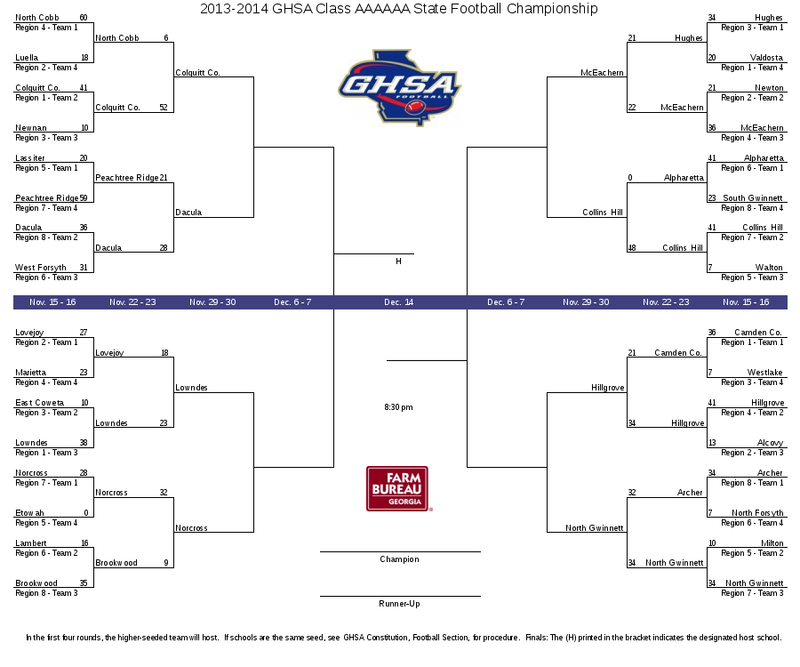 Parkview will host Colquitt County in the second round of the 7A playoffs. Colquitt County swept McEachern to advance. No. 11 North Gwinnett swept Rockdale County by a combined 21-1 score in two games. North Gwinnett (30-2) hit four home runs in the second game and will face Lassiter in the second round of the 7A playoffs. Lassiter swept Newnan to advance. In one of the more highly anticipated first round matchups, No. 12 Blessed Trinity swept previously nationally ranked Cartersville 4-1 and 10-1 to advance in the class 4A playoffs. Blessed Trinity will host Columbus in the second round. Columbus swept Thomson by a combined 21-4 score to advance. No. 20 Allatoona (29-3) swept Lanier 7-2 and 6-2 to advance to the second round of the 6A playoffs. Tyler Messick was a perfect 3-for-3 in game one with 3 RBI. Kyle Jacobsen was held without a hit in both games, struck out twice and scored three runs in eight plate appearances. Allatoona will host Effingham County in the second round. Effingham County swept Mundy’s Mill to advance. No. 48 Pope swept Creekside by a combined 20-2 score to advance to the second round of the 6A playoffs. Pope (25-5) will face Houston County who defeated Heritage-Conyers 4-3 and 4-3 to advance. Other notable Georgia first round series: Redan (23-9), the top ranked team in Georgia class 3A, swept Fannin County by a combined 17-2 score to advance. Redan will host Crisp County in the second round. Redan was the only Region 5-3A team that did not need three games in the first round. Lovett was the only other team from Region 5-3A to advance after defeating Dawson County in three games. Pace Academy and Westminster each lost to North Hall and Greater Atlanta Christian respectively in three games. Redan and Lovett tied in their first meeting this season 7-7 which ended in controversy, however recently the game has been awarded to Lovett 8-7. Redan won the second meeting 6-4. Both teams are on opposite sides of the bracket and could only meet again in the championship series. Lovett is not ranked in the Georgia Dugout Preview poll. Walton, who has been previously ranked nationally this season, swept Westlake by a combined 23-1 score in 7A to advance. Walton will face a dangerous Mill Creek team in the second round. Mill Creek (29-4) has victories this season over state contenders North Gwinnett, Parkview, Loganville (5A), Lassiter and Brookwood. Tucker (26-6) swept Brunswick by scores of 14-2 and 9-7 to advance. The Tigers will host River Ridge out of Region 6-6A in the second round. River Ridge (25-7) swept Dacula to advance an dis ranked No.4 in class 6A. The Georgia baseball playoffs begin this Friday across all eight classes. Several teams have been nationally ranked throughout the season. Here is a look at where Georgia schools stand nationally entering the playoffs. The Perfect Game HS Top 50 features six Georgia squads topped by third ranked Winder-Barrow (27-2). The Bulldogs are undefeated against Georgia opponents and posted a 5-2 OOS record against very strong national competition with the high point being a 3-1 showing at the USA National High School Invitational in March. Winder-Barrow will open the playoffs against Harrison. Harrison played in arguably the toughest region in class 6A and picked up a victory over Allatoona this season. Parkview (26-4) comes in at No.9 in the PG Top 50. The Panthers deep pitching and sound defense propelled them to 14 shutout victories this season. Parkview posted a 6-1 OOS record this season to go with instate losses state contenders to Allatoona (6A), Mill Creek (7A) and Brookwood (7A). North Gwinnett opened the season winning its first 20 games, are 28-2 entering the playoffs and ranked No. 11 in the PG HS Top 50. The Bulldogs went 4-0 in OOS games this season with instate losses to Mill Creek (7A) and Loganville (5A). As a team North Gwinnett is batting .331 and has a team ERA of 1.93. Blessed Trinity (27-3) comes in at No. 12 and may have the toughest first round opponent in previously ranked Cartersville. The Titans posted a 5-1 OOS record and suffered instate losses to Etowah (7A) and Kell (6A), both in higher classifications than Blessed Trinity. Blessed Trinity is batting .336 as a team with a 1.36 team ERA. Allatoona (27-3) comes in at No.20 in the latest PG HS Top 50 . The Buccaneers won their lone OOS contest while suffering defeats to Harrison, Dalton and Blessed Trinity. The Buccaneers signature victory of the season came against Parkview (7A). Allatoona as a team is batting .342 with 201 RBIs and a team ERA of 1.68. Rounding out the Georgia teams in the PG HS Top 50 is Pope (24-5) at No. 48. The Greyhounds were undefeated in OOS play with a 5-0 mark. Losses this season came to Cambridge, Dunwoody, Alpharetta and Walton. Pope remains ranked despite losing four of its last nine games to close the regular season. In the latest Max Preps Xcellent 25 rankings Winder-Barrow (No.3), North Gwinnett (No.5), Allatoona (No.12) and Pope (No.23) are ranked. In the latest Baseball America Top 25 Parkview tops the Georgia pack at No.8. Winder-Barrow (No.14) and Walton (No.22) are the only other Georgia teams ranked. The Georgia Dugout Preview final regular season rankings have North Gwinnett (7A), Winder-Barrow (6A) and Blessed Trinity (4A) ranked No.1 in their respective classes. Starrs Mill (5A), Redan (3A), Jeff Davis (2A), Gordon Lee (1A Public) and Savannah Christian (1A Private) round out the other top ranked teams entering Georgia playoff action. Georgia continues to occupy a number of spaces in the latest Perfect Game High School Top 50 national poll. Parkview is the highest ranked Georgia teams coming in at No.5. The Panthers swept a four-game spring break swing in Florida with victories over Jesuit, Sarasota, Venice and IMG Academy. The Panthers outscored those teams by a combined 14-1. Parkview extended it’s winning streak to 16 consecutive games with a pair of victories over Norcross this week. The Panthers have tallied seven shutouts during the winning streak. Winder-Barrow (23-2) continues to climb the rankings moving up to No.7. The Bulldoggs have followed up their 3-1 showing in the National High School Invitational with a three-game sweep of region foe Habersham Central to go with two victories this week against Apalachee. North Gwinnett (24-2) is the third Georgia team in the top ten coming in at No.9. The Bulldogs have won four of their last six games. They have defeated Discovery and Peachtree Ridge this week. No.19 Allatoona (23-2) ran its winning streak to nine after defeating Stockbridge, Grayson County (KY) and North Atlanta at the Perfect Game Spring Fling at Lake Point. The Buccanners outscored those three foes by a combined 26-1 score. The Buccaneers rule-ruled Osborne 15-0 this week and face Dalton in a home-and-home series with region 6-6A first place on the line beginning Friday in Dalton. Blessed Trinity (No. 12), Pope (No.15), Walton (No. 37) are the other teams in the Perfect Game HS Top 50. As the Georgia high school baseball season begins to come down the home stretch and head for the playoffs, several teams can be found in the national rankings. Pope (7), Winder-Barrow (10), North Gwinnett (12), Parkview (17), Blessed Trinity (19), Allatoona (21) and Walton (30) all are in the latest Perfect Game Top 50 high school rankings. North Gwinnett (7) and Winder-Barrow (21) are also ranked in the latest Baseball America HS Top 25 rankings. Winder-Barrow (7), North Gwinnett (9) and Allatoona (12) also come in ranked in the latest Max Preps Xcellent 25. Here is a brief look at each team and their upcoming schedules this week. Pope (19-2) had its 14-game winning streak snapped last week falling to Cambridge 4-2. Pope will face county rivals Lassiter and Walton this week. Chase Smith and Ryan Webb have been solid for Pope in the pitching department this season. Offensively the Greyhounds have been solid averaging just over seven runs per game while yielding just under three runs per game. Winder-Barrow (18-2) went 3-1 at the National High School Invitational last week in Cary, NC with victories over No.3 Huntington Beach (CA), No.16 American Heritage (FL) and Rocky Mountain (CO). The Bulldoggs lost in the semifinals to Dana Hills (CA). Winder-Barrow will wrap up the regular season with series against Habersham Central, Apalachee and Lanier before the state playoffs. Darrel Woodall (P), Daniel Buice (P), Will Hargraves (IF/P), Beau Hanna (C) and Pat DeMarco (CF) pace the senior-laden team. Allatoona (19-2) has won six in a row and will face Stockbridge and North Atlanta this week in the Perfect Game Spring Fling at Lake Point. An all-important 2-game region series against Dalton still remains on the schedule. Kyle Jacobsen is the highlight player for the Buccaneers. Jacobsen enters the week batting .471 with 21 RBI 3 HR and is 5-1 with a 0.95 ERA and 23 strikeouts on the mound. David Smith (C; .417 24 RBI 2 HR), Payton Eeles (2B; .368 13 RBI), Blake Evans (SS; .417 6 RBI), Skylar McPhee (3B; .343 16 RBI) and Tyler Messick (1B/3B; .324 13 RBI) make Allatoona a championship contender in the heavy 6A classification. Head coach Keith Hanson recorded his 300th career victory earlier this season in a 10-1 victory over Creekview. Class 7A is represented by North Gwinnett, Parkview and Walton. North Gwinnett (20-1) opened the season winning its first 20 games before falling last week 6-2 to Mill Creek. The Bulldogs pitching is anchored by seniors Jake Brace and Cade Heil. Brace is 5-1 with a 1.43 ERA to go with 32 strikeouts. Heil is 4-0 with a 2.13 ERA and has fanned 53 batters this season. Sophomore Micah Borah leads the team in batting average at .463 and is second in RBIs with 20. Parker Coyne leads the team in RBIs with 22 and is batting .437 with a pair of dingers on the season. Parkview (18-3) opened a four-game stretch over spring break in Florida with a 3-0 victory over Jesuit (No.12 in Baseball America HS Top 25) on Monday. The Panthers will face Sarasota (FL), Venice (FL) and IMG Academy (FL) this week while in Florida. Parkview will close the regular season with two-game series against Norcross, Meadowcreek and Brookwood after returning from Florida. Senior Joey DeMasi has powered the Panthers at the plate this season batting .361 with 32 RBI and 8 HR. Logan Cherney (.424) and Jonathan French (.325) are tied for second on the team in RBIs with 18 apiece. Caleb Mitchell and Braden Hays bring the heat from the mound. Mitchell is 5-1 with a 0.92 ERA and 35 strikeouts while Hays is 5-0 with a 2.15 ERA and 39 strikeouts. Walton (18-4) was ranked as high as eighth this season in the Perfect Game Top 50 comes in at No. 30. The Raiders split two games with Etowah last week and will face Cambridge and county rival Pope in a rematch of last seasons state championship series this week. Walton will close out the regular season with a pair of three-game series against Lassiter and Woodstock. Senior pitcher Luke Bartnicki has tossed a no-hitter this season, has over 55 strikeouts and has hit 90-plus on the radar gun multiple times.